Larrauri reportedly was established ca. 1870 and ceased operations in 1900. 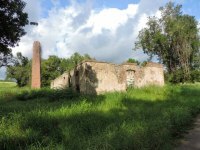 Photographed are the remains of the sugar factory building and the smoke stack. 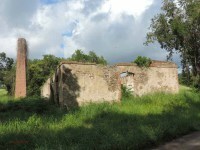 Supposedly, the remains of the "Tren Jamaiquino" used in that era can be seen inside the factory building. The "tren Jamaiquino" is the name given to the method used to cook the "guarapo" or juice extracted from the sugarcane consisting of a series of side by side small tanks or kettles where the cane juice or "guarapo" was heated in succession to reduce it to molasses. The "Tren Jamaiquino" used one heat source for all kettles as opposed to the previous methos called "Tren Español" which consisted of an individual heat source for each kettle. Although it is reasonable to think it was owned by the Larrauri family of Coamo, we do not have any information as to the specific owners of this Ingenio during its years of operation.